In a ruling issued in early May, federal district judge Jesse Furman of the Southern District of New York rejected copyright and trademark claims brought by graffiti artist Itoffee Gayle against cable giant HBO, on the basis that HBO’s use of Gayle’s artwork was de minimis. See Gayle v. Home Box Office, Inc., No. 17-CV-5867 (JMF), 2018 WL 2059657, at *2 (S.D.N.Y. May 1, 2018). The claims arose out of an episode of HBO’s television show Vinyl; in one scene, a woman walks down a city street and passes a dumpster tagged with graffiti, which reads “art we all.” Gayle argued that, because he created that graffiti, HBO infringed his copyright by depicting it without his permission, compensation, or attribution; he also argued that the phrase is his trademark and HBO used it in a way that would cause consumer confusion. His complaint sought $1.5 million in damages, among other things. The court explained that, in the copyright arena, de minimis can mean “a technical violation of a right so trivial that the law will not impose legal consequences,” or it can mean “that copying has occurred to such a trivial extent as to fall below the quantitative threshold of substantial similarity, which is always a required element of actionable copying.” The court looked for guidance to a number of earlier cases in this arena, many of them involving artwork that is shown in the background of a scene as part of a movie or television show. Such cases often examine the issue in terms of “observability,” considering factors such as how long the artwork appears on screen; how clearly it is visible (for example, is it shown by itself or in a close-up shot, or is it obscured or out of focus? ); and whether it is mentioned onscreen or plays some meaningful role in the plot. Here, the court held, Gayle’s graffiti appears as a “fleeting” image that was “barely visible”; under these circumstances, HBO was not liable for any copyright infringement. For similar reasons, the court rejected the trademark claims; even assuming the graffiti qualified as a protectable mark (a question the court did not reach), the court held that no viewer of the show would be confused about whether there was some sponsorship-type relationship between HBO and Gayle, given how “difficult” it would be “for even a keen observer to pick out” Gayle’s trademark. He likewise dismissed New York state law claims on the same grounds. The court dismissed evidence from Gayle that an Instagram user had congratulated him on the appearance of the graffiti in the episode; the court held that one anonymous user was “hardly a stand-in” for the “average lay observer” relevant to the copyright inquiry, or the “ordinary prudent purchasers” relevant to the trademark inquiry. Notably, the court clarified that even if HBO had used the graffiti purposely, i.e., Gayle’s work “was chosen to be in the background for some thematic relevance,” that intent was irrelevant, because intent does not transform an otherwise de minimis use into an actionable use. 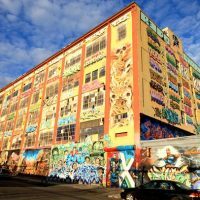 As we’ve observed often in recent years, graffiti art is a hot commodity both in pop culture and in the art market, resulting in a number of court cases by graffiti artists against large companies who exploited graffiti art without permission. But those cases are still governed by the same legal principles that govern all copyright cases, and the same defenses are available to the defendants. We have written before about the de minimis defense to copyright infringement (see here for another recent case that raised this issue) but it’s generally discussed less often than the fair use defense. Like the fair use defense, the de minimis defense doesn’t lend itself to black-and-white rules, so case law can provide guidance and examples but rarely provides clear-cut directives to future litigants. Indeed, as other legal commentators have pointed out, the de minimis defense is logically related to the fair use defense in that one of the fair use factors is “the amount and substantiality of the portion used” of the copyrighted work; indeed, one writer frames the de minimis exception as a situation where the court “need not go through a full fair use analysis” because the answer becomes clear at the “amount and substantiality” step. While some cases might present a closer question as to whether a use is really de minimis, the court here opined that Gayle’s claims “border[ed] on frivolous,” given that his work appeared so briefly and insignificantly as to be barely observable. Importantly, this particular case was decided on a motion to dismiss; that means that the dispute was resolved before the parties had to incur the expense of discovery. (We’ve noted in the past that courts are sometimes reluctant to dismiss a case on fair use grounds at the motion to dismiss stage.) And the court also refused to allow the plaintiff to amend the complaint, because there was no indication that he would be able to cure the fundamental substantive problems with his claims. The court also made a formal certification that any appeal “would not be taken in good faith”; as a practical matter, this is simply a procedural mechanism that means that Gayle, who was acting pro se in this case, will need to pay certain court fees associated with the appeal, but as a gesture, this is an unusual step that underlines the court’s view of the weakness of Gayle’s case. Remarkably, however, Gayle has already filed an appeal to the Second Circuit anyway. In general, this case serves as a useful illustration of a different defense to copyright and trademark claims, and a reminder to parties to consider the expense of litigation in light of the likelihood of a successful recovery.